Cacti are often thought to be self-sufficient. While they are generally hardy, low-maintenance plants, they do need some care and attention in order to stay healthy and thrive. Once you pot your cactus, be sure to provide the right amount of sunlight, water, and fertilizer. Then, take steps to deal with pests or diseases promptly if they become an issue. Select a pot size based on the type of roots your cactus has. If your cactus has a shallow root system that remains close to the surface of the soil, such as cholla or prickly pear, select a pot that is shallow with a large diameter. If your cactus has a deep root system, like saguaro or cardon, choose a pot that is narrow and deep. Most cacti have shallow root systems. If you are unsure which type yours has, choose a pot that is somewhere in between (like a bonsai pot). Make sure the pot has drainage holes. Whether you choose a heavy, durable pot made of clay or an easy-to-clean plastic pot, just be sure that excess water can escape the container. 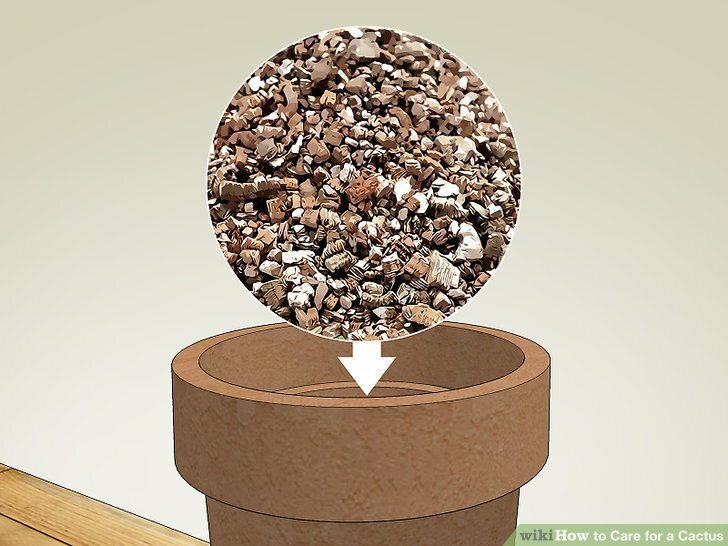 Without drainage holes, the soil will remain too moist and this can lead to root rot and will eventually **** your cactus. 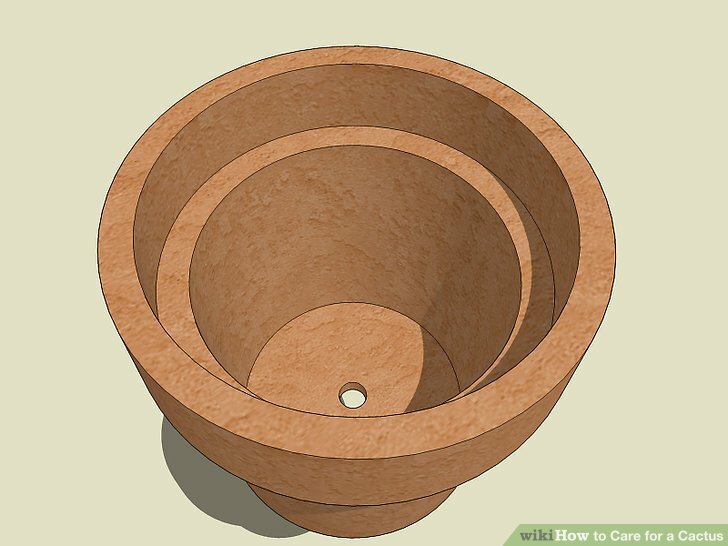 If you pick out a pot that doesn’t have adequate drainage, you can easily drill holes in it. Pick a potting mix specially made for cacti. You may be able to find a commercial mix that will make planting your cactus easy. Potting mix that is made for cacti is specially-formulated to allow for adequate drainage. Look for it at garden centers, home improvement stores, nurseries, or online. As an alternative, make your own soil. Simply combine one-third horticultural soil (like commercial-grade potting mix), one-third high-quality horticultural sand (washed, coarse, and sharp), and one-third grit (such as porous gravel, lava fines, or fired clay). This mix will give your cactus the proper nutrients and drainage required to keep it healthy and thriving. Remove the cactus from the container it came in. The cactus likely came in a small plastic container, and it's easy to remove the cactus so you can repot it. Put on gardening gloves to protect your hands from the cactus spikes. 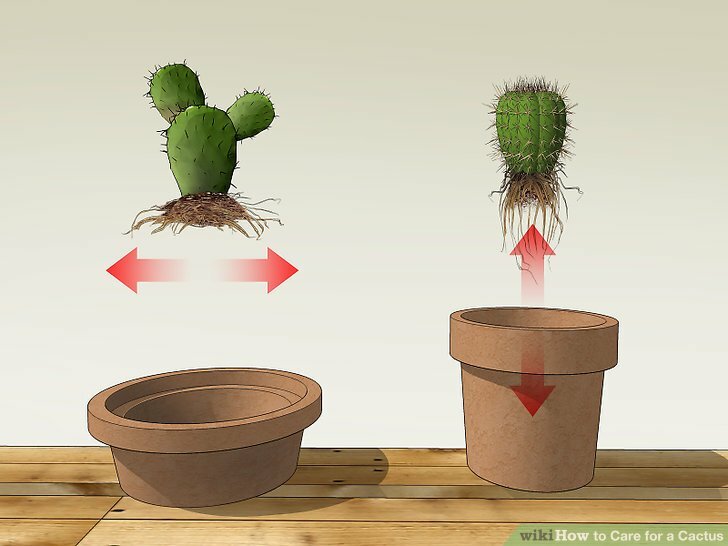 Tip the cactus upside down and gently squeeze the container while tugging gently on the cactus to remove it from the pot. Plant the cactus in the pot, then water it lightly. 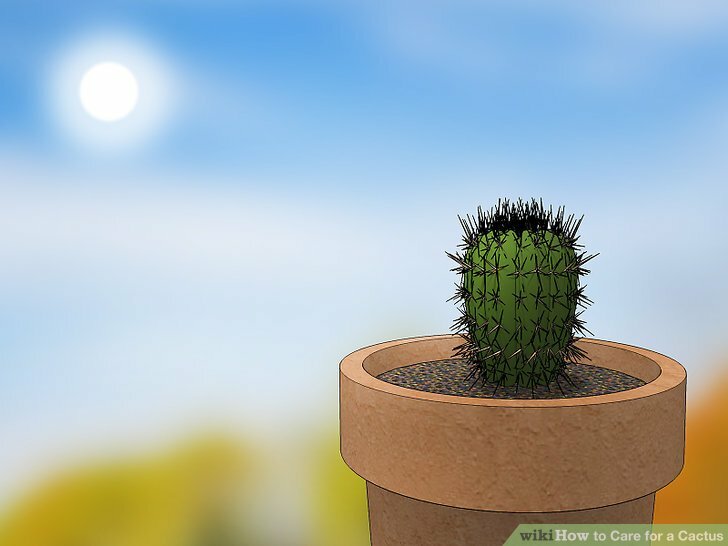 Simply fill your pot with the prepared soil, dig a hole a little larger than the root ball, and place the cactus in the hole. Lightly tamp down the soil around the cactus when you're done. Then, lightly water the soil so it compacts. Aim to get the soil damp, but don't soak it so much that water runs out of the drainage holes at the bottom of the pot. The growing season for cacti is during the spring and summer while the temperatures are hotter and there are longer periods of daylight. Depending on the type of cactus and soil as well as the amount of sunlight and heat the cactus gets, you may need to water more or less than once per week. If the cactus feels mushy, you're watering it too much. Other signs of overwatering include rotting and brown or black leaves. 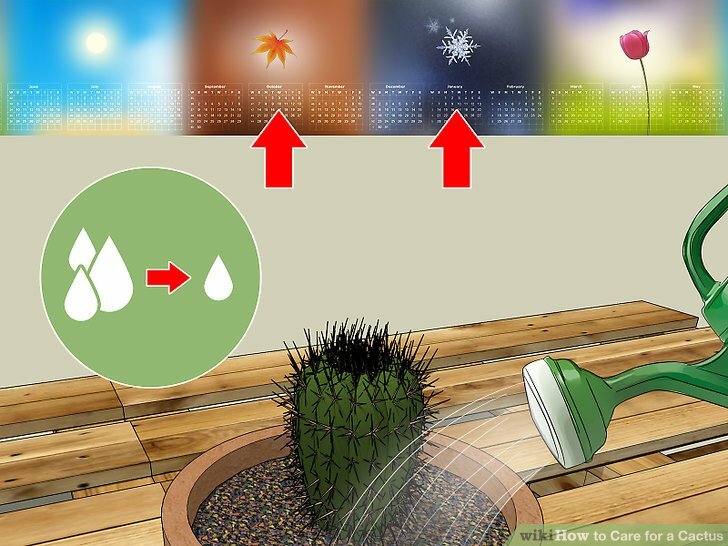 Give your cactus less water during the dormant season. Most cacti rest during the fall and winter, or whenever the days are cooler and shorter. 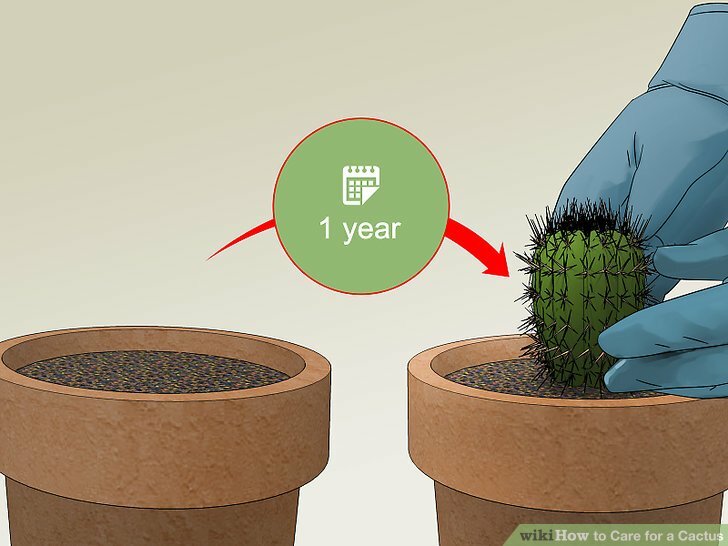 During this time, you still need to water your cactus after the soil dries out—it just won’t need to be done as often due to the difference in weather. Water the cactus just often enough that it doesn't begin to shrivel up. 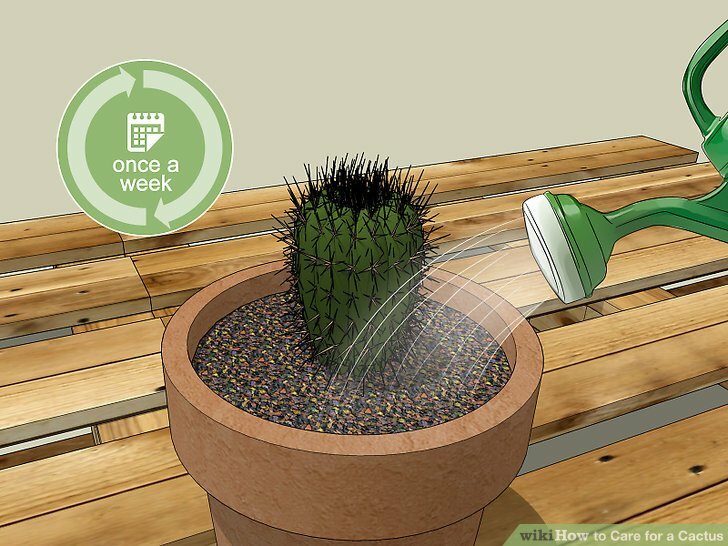 The location of your cactus will have a lot to do with how often you need to water it. If it is on a window sill and gets lots of sunlight, or is near a heating vent, you may need to water it more often. Add fertilizer each time you water during the growing season. Choose a fertilizer with equal parts of nitrogen, phosphorus, and potassium (a 10-10-10 ratio) or more phosphorus than nitrogen (a 5-10-5 ratio). 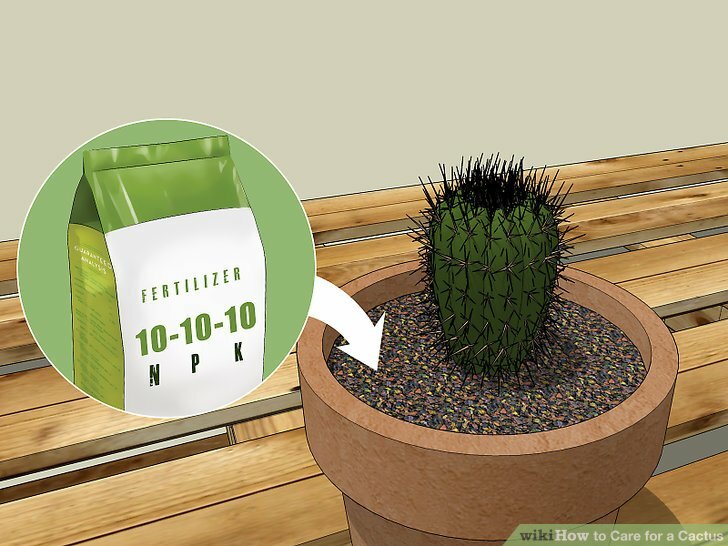 Dilute the fertilizer to one-quarter to one-half strength by mixing it with water before adding it to your cactus. Follow the instructions on the label to determine how much fertilizer to use. Do not fertilize your cactus while it is dormant (during the fall and winter). 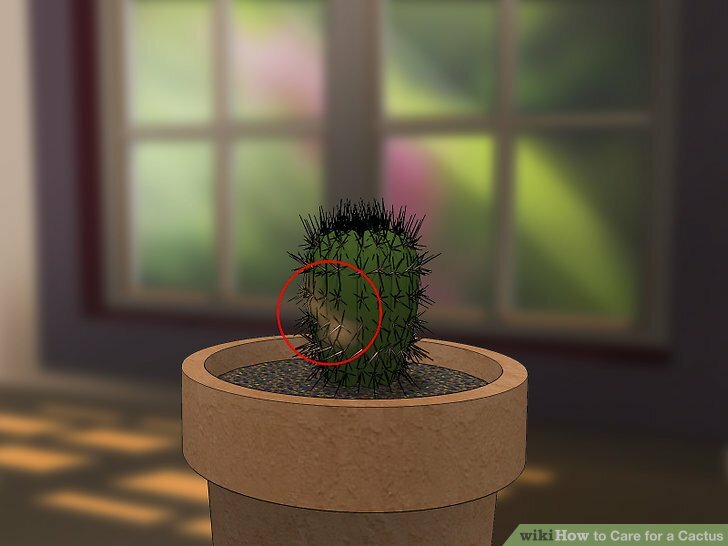 Move your cactus to a less sunny area if it appears off-colored, faded, or scorched. If your cactus looks yellow or orange, “bleached,” or has dry patches, it is a sign that it is receiving too much light. Move your cactus away from the light and to a location where it gets less sunlight and heat. Be on the lookout for these signs if you move your cactus to a new, sunnier location. Relocate your cactus to a sunnier location if it appears to be leaning. While it is natural for plants to lean slightly toward the light, one that is leaning heavily is telling you that it needs more sunshine. Do not allow your cactus to stay in this condition for very long—the lack of sunshine may also mean the soil stays too moist for too long. For a slight lean that happens over time, simply rotate the pot occasionally. Be careful when transitioning the cactus to a brighter location. Sudden intense light can scorch it and cause permanent damage, so increase the sunlight by small amounts at a time. For instance, if the cactus gets 4 hours of sunlight a day and doesn't seem to be thriving, move it to an area that gets 6 hours of sunlight a day rather than 8 hours of sunlight a day. Repot your cactus every year to keep it healthy and thriving. Repotting your cactus is a good way for you to monitor the root system. Fill a new, larger pot with potting soil formulated for cacti, dig a hole the size of the rootball, then place the cactus in the hole. Make sure the roots have sufficient space and aren’t growing too close to the inside edges of the pot or extending through the drainage holes. If your current pot seems to be in proportion with your cactus, just go ahead and change out the soil to get a fresh start. However, if your cactus has outgrown the pot, it’s time to switch to a larger one. Just make sure the new pot has adequate drainage! 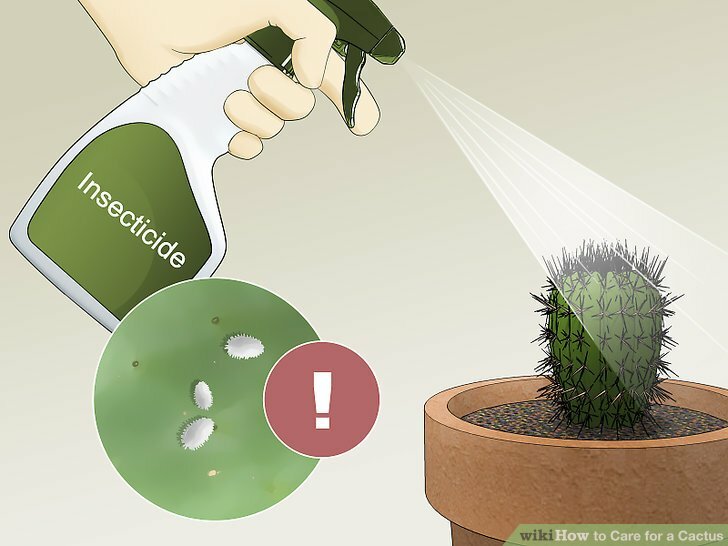 Remove scale then treat the cactus with insecticide. Scale is created by various scale insects and often presents as white or gray patches on the plant. It may also look moldy or fuzzy. If you see scale on your cactus, sc**** it off with your fingernail or use a strong stream of water to blast it away. 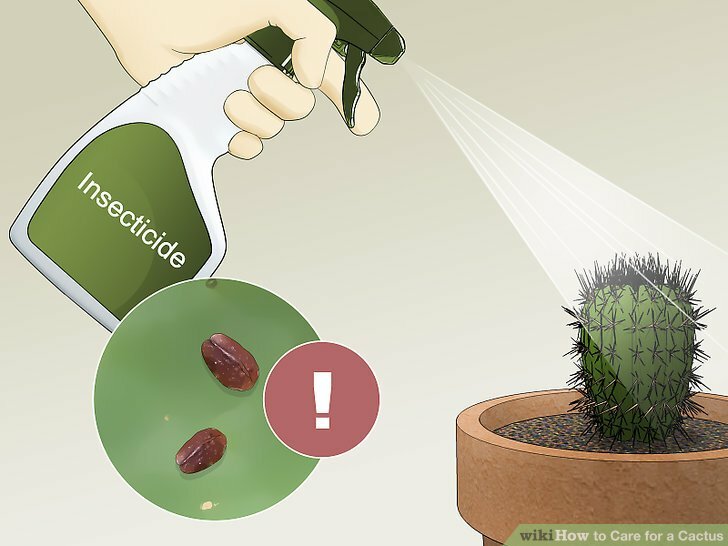 Then spray an insecticide on the cactus to prevent the scale insects from coming back. Pick off mealybugs and spray the plant with insecticide. Mealybugs are a common pest on cacti. They may live on the plant itself or in the soil. If you see dark little critters on your cacti or in the soil, pick off the bugs by hand or rinse them away with water. Be sure to follow up with an insecticide formulated for cacti to **** the remaining bugs. Treat red spider mites with pesticide. Be on the lookout for small, red mites as they can quickly **** a cactus. Other signs of spider mites include silky cobwebs and dry, brown parts of the plant (which occur due to the mites feeding on the cactus). Promptly isolate the cactus as soon as you notice these signs. Then, treat the cactus with a pesticide designed to **** spider mites. Plan to reapply the pesticide every week in order to **** any remaining eggs. There is no specific formula for caring for your cactus. Proper care depends on the type of cactus, its location, and the quality of the soil and water you use. The best way to care for it is to watch for the signs (how much room the roots have, how wet or dry the soil is, if it is leaning towards the light, etc.) to determine what it needs. Most types of cacti have some sport of spines, and some are more pokey than others. 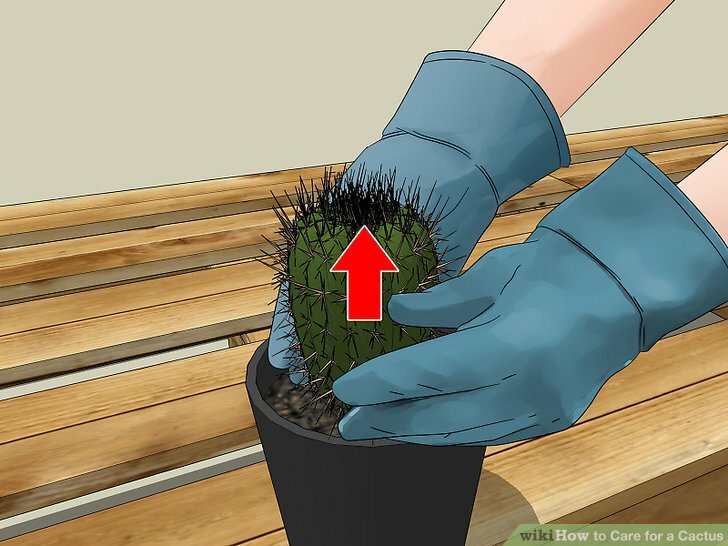 To avoid being pricked by a sharp spine, always wear thick gloves when handling your cactus.